Heart-pumping thrills and strikingly beautiful landscapes await in New Zealand’s resort town of Queenstown, which sits on the shore of Lake Wakatipu, set against the dramatic Southern Alps. World famous thanks to its scenic backdrop being featured throughout the Lord of the Rings trilogy, Queenstown is a mecca for outdoor enthusiasts, offering a plethora of thrilling activities including jet boating, kayaking, white-water rafting, bungee jumping, skiing and hiking. If you’d rather sit back and relax during your stay, sample some fine local pinot noir from one of the 75 local vineyards, enjoy a cruise through nearby Milford Sound, or take a day trip and explore some of the quaint neighbouring towns, including Arrowtown, Glenorchy, Wanaka and Cromwell. Looking for Queenstown accommodation? 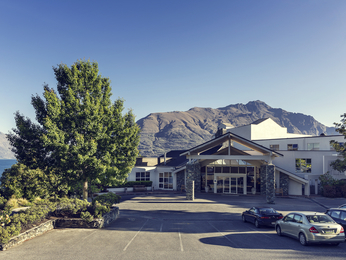 Mercure Queenstown hotel is idyllically situated and offers breath-taking views over Lake Wakatipu and the Remarkables Mountains. Contact our team at Mercure Queenstown Resort for more information on planning your Queenstown vacation.